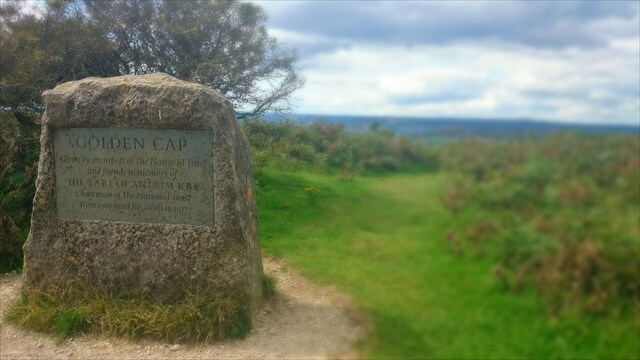 Golden Cap: The Highest Point on the South Coast! There is NO PHYSICAL CONTAINER, and to log a find you need to email the answers to the questions below to me, by clicking on 'heartradio' just below the cache title and then clicking 'Send Email'. If after 24 hours of you logging your find I still haven't received your answers, your log is at risk of being deleted. You have been warned. GOLDEN CAP - THE HIGHEST POINT ON THE SOUTH COAST! Golden Cap is a hill and cliff situated on the English Channel coast between Bridport and Charmouth in Dorset, England. The cliffs are the highest point on the south coast of Great Britain. The name derives from the distinctive outcropping of golden green sand rock present at the very top of the cliff. 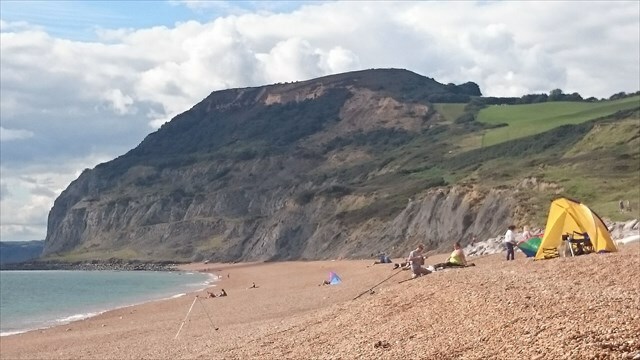 The hill forms part of the Jurassic Coast, a World Heritage Site. 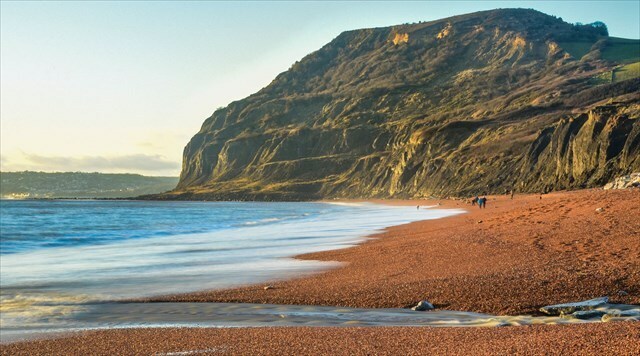 The Jurassic Coast is 155 kilometres (96 mi) in length running from Orcombe Point near Exmouth, in the west, to Old Harry Rocks on the Isle of Purbeck, in the east. The coastal exposures along the coastline provide a continuous sequence of Triassic, Jurassic and Cretaceous rock formations spanning approximately 185 million years of the Earth's history. The Jurassic Coast contains a large range of important fossil sites. Golden Cap is comprised of two ages of rock from the Jurassic and Cretaceous periods. The base of the cliff is dark grey mudrock. The top of the cliff is made of superficially golden coloured sandstone called the Upper Greensand that formed in the Cretaceous Period about 100 million years ago. When fresh it is actually a striking green colour due to the presence of a marine clay mineral called glauconite, but when it is exposed to daylight and weathered glauconite turns a golden colour giving the headland its ‘golden cap'. The gap between these two rock types is called an unconformity and represents a break in the rock record caused by erosion. The very flat top of Golden Cap is actually a remnant of an ancient river terrace that formed after the Cretaceous. The gravely deposit was left behind by a river that was eroding the uplifted older rocks. Chert form the Upper Greensand can be found in the gravel, which bears testament to this time of erosion. This ancient river terrace can be traced inland forming the flat tops of hills to the north west of Golden Cap. 1) Describe and compare the differences in cliff colour, shape and height as you look East towards Portland and West towards Lyme Regis. 2) Identify the rocks you can see making up the cliffs. 3a) Look at the stone slab with a plaque on it. What evidence can you find on the back of the rock that it originally came from this area? 4) Measure your altitude at the plaque. 5) OPTIONAL TASK: Take a photo of yourself or your GPS with the FRONT of the plaque. Any photos of the back will be deleted, as they give away answers. Please email your answers to me via my geocaching profile. Your log will be deleted if you put the answers in it. Thanks to the National Trust for giving permission to place this cache. Guvf vf na Rnegupnpur, fb gurer vf ab pbagnvare. ERNQ GUR QRFPEVCGVBA!